Hi guys! I get a lot of questions on becoming a dietitian. I did my Bachelor of Science in Nutrition and Master of Science in Public Health Nutrition at Case Western Reserve University in Cleveland, Ohio. Here are some of my top tips and resources! Great question. 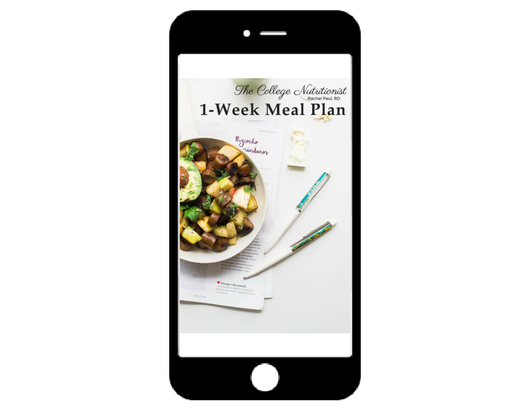 In sum, a Registered Dietitian (also called Registered Dietitian Nutritionist) has gone through extensive training at a university levels, has completed a supervised Dietetic Internship (DI), and has taken and passed a national exam. RDs must complete a number of continuing education each year. Nutritionist, on the other hand, is a general term that can apply to a number of individuals, with no specifications on their training and education. In order to become a dietitian, you must go through an accredited program. Not all universities and colleges offer an accredited program, so be sure to choose wisely. In addition to nutrition courses, a certain number of science courses are also required. 1. Talk to as many people in the field as possible. You’ll not only make connections (which can help down the line when you’re looking for jobs), but you’ll be able to see the wide world of nutrition and what job opportunities are available. You have the benefit of being a student here – reach out to different professionals on social media and on LinkedIn and ask for an informational interview. 2. Intern & work. Get a variety of actual experiences in a number of food & health-related industries – volunteer at a hospital, work at a restaurant, intern for a public-health agency, etc. The more different experiences you have, the better prepared you will be. In undergrad, I worked as a research intern at Cleveland’s Prevention Research Center, volunteered in University Hospital’s foodservice center, interned at Children’s Hospital of Philadelphia’s Healthy Weight Program, interned at Cleveland’s Department of Public Health (which led me to a TV role as a nutritionist on their weight loss program for government employees), and worked at a smoothie restaurant on Case’s campus. 3. Get involved. Serve on your school’s nutrition or cooking club’s leadership team, get involved in your state or city’s dietetic association, or get involved in other related leadership organizations in your area. In undergrad, I was the president of the Student Dietetic Association. 4. Get to know your professors. Your professors will ultimately be writing you letters of recommendation. Make sure they know you as a person, outside of your grades alone. Book some of their office hours and ask them about their recommendations for getting ahead in the field of nutrition, and keep them informed of your progress at school.